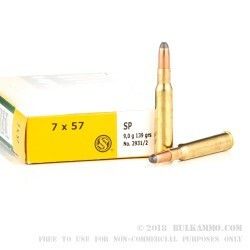 The 7x57mm Mauser was one of the very first rifles to use smokeless powder cartridges right from the get go, which made it immediately popular for the superior ballistics that it offered. Smokeless powder is a lot more common nowadays than it was in the 19th century, but the Mauser has held on to a great deal of its popularity for other the excellent aspects of its performance. 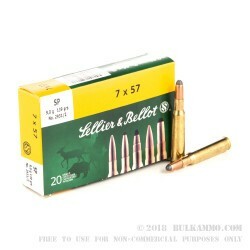 This cartridge by Sellier & Bellot features a 139 grain projectile. It’s a soft tip bullet, which true to its name has an exposed part of its lead core at its point. 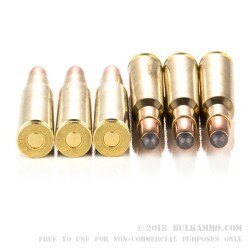 When this bullet hits a target, its copper jacket will help the bullet to mushroom out for expanding damage much like a hollow point offers. As such, this is a great round to rely on if you’re going to take a whitetail with your trusty Mauser. 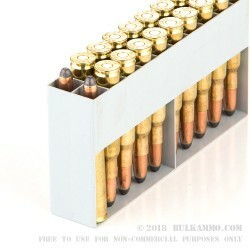 Keep that momentum going by reloading this cartridge once it’s spent -- the factory fresh brass casing is up to the task!